Abstract Earth Project and Bubblin are amped to be teaming up in welcoming back one of our very favorite DJ/Producers, Pearson Sound. This time round we’re hosting him within the cozy confines of Groove Suite, Portland’s premier house music club, on their impeccable Alignment Sound System, complete with perfectly tuned 21″ subwoofers. This is going to be hands down one of the best dance parties of the year, don’t miss this unique chance to see one of the most celebrated producer/dj’s of our times in this ideal and intimate venue. Following a momentous year of releases in 2010 and having concentrated his output under the Pearson Sound moniker, David Kennedy’s following 12 months have been just as busy; but for different reasons. Releasing a critically acclaimed FABRICLIVE compilation in March he’s since remixed and opened for one of music’s most respected acts, Radiohead, in New York. Having travelled across Europe on the first Hessle Audio tour of the continent he’s also DJd on the London Eye, lectured at Red Bull Music Academy in Madrid and he’s constantly finding himself in new and interesting positions; whether that’s following Moodymann on a Sunday afternoon in a London basement or pre-empting Rusko at an open air festival. 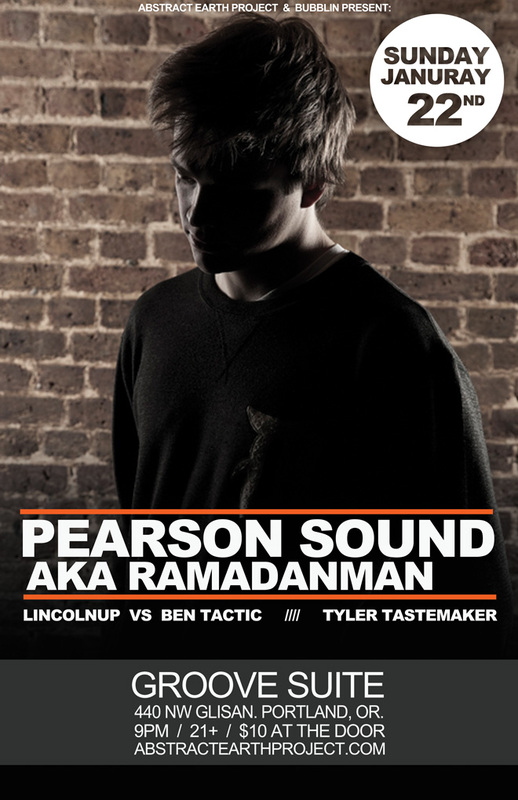 Still very much a key component in the running of the Hessle Audio label, whose ‘116 & Rising’ compilation managed to emphatically collate their history whilst simultaneously looking to the future and their imminent 20th release, Kennedy’s output as Ramadanman may have ceased, but his subsequent work as Pearson Sound and as Chicago house ‘legend’ Maurice Donovan commands much the same level of gravitas with long sold out white label releases and a 12” on Night Slugs. Musically, he’s looking forward, refusing to sit still or be easily categorised. And with his latest productions feeding more from the classic notions of 4×4 dancefloor music and his sets retaining every inch of precision and his selection spreading out further as his knowledge of music grows he has established himself as one of the UK’s most in demand artists. This entry was posted on January 6, 2012 at 2:08 pm and is filed under Ben Tactic, Bubblin, Lincolnup, Ramadanman. You can follow any responses to this entry through the RSS 2.0 feed. You can leave a response, or trackback from your own site.